One of nature’s wonder is the lemon. This citrus fruit has numerous beauty and health benefits. It can improve digestion, treat numerous skin problems reinforce the immune system and help you lose weight. It has often become very effective in fighting numerous health problems making it one of the most used natural remedies at home. Lemon is effective when comes to cleaning the skin and keeping it healthy. It is because of the powerful astringent and antibacterial agent present in it. Combine lemon juice and sugar. Massage the mixture on your face leaving it for 15 minutes before you rinse it with water. Repeat the process before going to bed every night to achieve a better than ever skin! If ever you are suffering sore throat, try squeezing a lemon in a half glass of water. Gargle the solution a few times daily. This will relieve the inflammation and pain quickly as well as disinfect your throat. In a short period of time, lemon can help you eliminate your pimples. Make a paste using a combination of a quarter of a crushed aspirin and some lemon juice. Apply it on the area affected and leave it overnight. Then, in the morning wash your face with water. Repeat the process daily until the pimples fade. It is really difficult to get rid of canker sores. However, with the use of lemon juice, it can easily be eliminated. Do this by applying the juice directly on the sores 3 times daily. It will soon relieve you from discomfort. Make a mixture using a tablespoon of honey, 2 tablespoons of ground oats and some lemon juice. Apply the paste on your underarm and leave it for an hour to work. After that, rinse it with water. Repeat it daily until the desired results are achieved. Nothing’s better than lemon juice when it comes to giving your hair natural highlights. To do this, you must apply the juice on selected areas of your hair, leaving it in the sunlight for an hour to let it dry. Next, wash your hair using a mild shampoo. Repeat this process until you achieved the beautiful highlights you want. Before going to bed, apply some lemon juice on your lips to prevent cracks and to keep them hydrated. 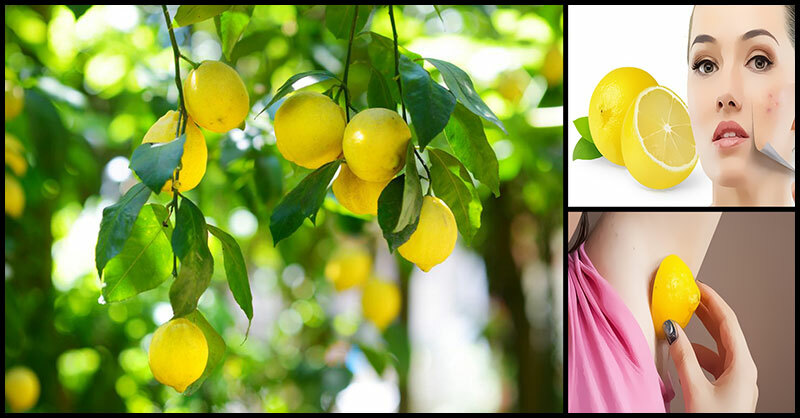 Lemons are very effective in keeping your lips from severe weather conditions thus, giving the lips a nice glow. To keep the nails healthy and protected against numerous problems, soak it in a lemon juice for 15 minutes. Because of its antibacterial properties, lemon can whiten your teeth and clean your oral cavity. Make a paste using baking soda and some lemon juice. Put a bit of the paste on your toothbrush. Use this paste to clean your teeth every day. After a few days, the results should be noticeable.